Earn up to 1,360 reward points. A super-flexible, ultraclean range of effects! The gorgeous-sounding MXR M-134 Stereo Chorus Pedal will remind you how cool chorus can be. Want to add sparkle to clean-toned arpeggios? Animate strummed passages? Widen and fatten distorted power chords? This box will do it all, cleanly and quietly. Set the Rate and Width controls to your liking and then dial in as much effect as you want with the Intensity knob. You can then shape the tone even further by EQ-ing the modulated frequencies with the bass and treble controls. Run in mono or use the stereo outputs for a huge, vibrant sound. 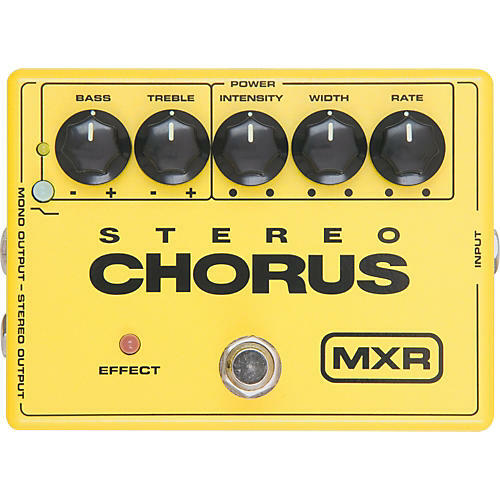 If you're looking to preserve the low end of your guitar tone, the MXR Stereo Chorus has got you covered with its Bass Filter button that applies the effect to the high frequencies only. Check out this chorus that is like no other. We guarantee you'll be impressed...or your money back!